According to the New Year post of U2’s front man, Bono, the songwriters are being stuck with a ‘poor deal’, but he did appreciate Apple for making the effort to get the artists paid. He said that in this digital era, the songwriters aren’t getting any returns, but he appreciated the effort made by Spotify and Apple to help musicians in getting paid for their music streaming and downloads. The latest comments regarding digital music were made by U2’s head in a blog post made on the website of the band for marking the beginning of the year. This post was written while Bono is recovering from a serious cycling accident. He added that the iTunes giveaway of the band’s album called the Songs of Innocence had proven to be extremely controversial as a lot of people were annoyed because they like being annoyed or felt like they were robbed off their phone, which was later returned to them after being used. 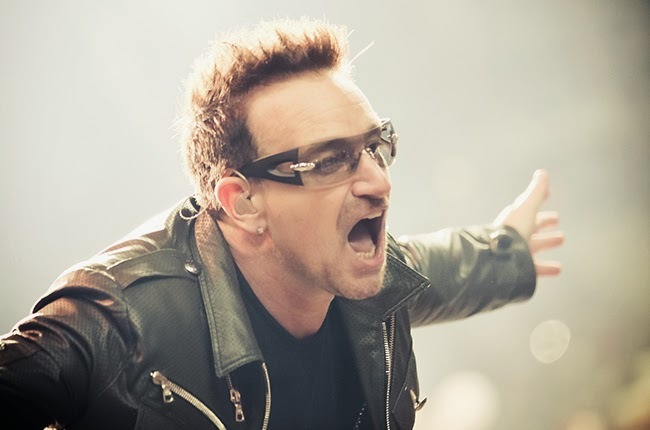 The front man stated that he understood the feeling of the latter group, but told the annoyed group to watch a video of Jimmy Kimmel, the US chat-show host who had said that Bono should give a very negative response to those who were complaining. Even though the partnership of Apple Inc. and the band has received some heavy criticism, Bono was only interested in praising the iPhone maker and said that anyone who has the urge to listen to music or even make music should be grateful that the American firm is a music company too. The musician said that the company is unique in its efforts to get the artists paid. It agreed to pay for the album and then gifted it to all music lovers out there, which was simply beautiful, as stated by Bono. The question of how much the Cupertino, California-based company paid for the album wasn’t revealed by the company nor the band and the figure of $100 million reported in the media was just a misleading figure. This is because it also includes the cost of the marketing campaigns carried out by the firm that featured music from that particular album. Apart from that, Bono also praised Spotify, the music streaming service, for its actions even though it had been highly criticized by some artists. The most prominent artist to do so was Taylor Swift, who spoke about its payments to songwriters and artists. He said that the internet had flattened the uneven playing field by giving people access to information. The good part about Spotify was that it convinced people to pay $10 a month as subscription for accessing music that they could have gotten for free. While this figure cannot replace income from digital and physical sales, but it is a good start. This isn’t the first time that Spotify has been defended by Bono because he did the same in November at the Web Summit conference when he said that rather than targeting their ire at streaming services, musicians should focus them on labels.